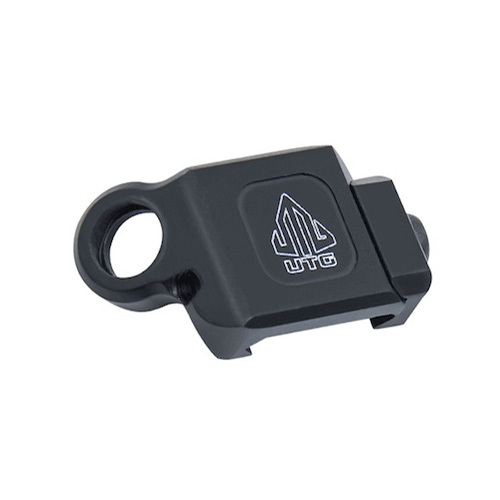 UTG Low Profile Picatinny-mount 45 Degree Angled Offset Quick-detach Sling Swivel Adaptor. - Precision Machined from Aircraft Grade Aluminum with Hard Anodizing Matte Black Finish. - Rugged Mounting Base with Max Strength Torx Drive Locking Screw to Fit on Picatinny Rail. - Extremely Compact, Lightweight, and Super Low Profile. - Accepts any Quick Detach Sling Swivel with 0.37 Diameter Swivel Stud. - Mount Reversible for Right- or Left-handed Sling Use. - QD Swivel Housing Designed with Quarter-turn Rotational Overtravel Stops to Better Control Sling Position and Movement. - Includes T20 Torx Allen Wrench for Simple and Friendly Installation, No Gunsmith Required.